The most wonderful thing about this community of writers is the chance to hear new music. I think I can safely say I have bought new music at the recommendation of just about every writer I follow. One such writer is J from Resurrection Songs, an amazing musician in his own right. I’m not sure exactly how it happened, but through following him, I also ended up following his fellow countryman, Scottish singer/songwriter Dave Arcari. Arcari has an engaging social media presence, so after following for a while and checking out his videos and live clips, I decided to finally buy an album. I chose 2017’s Live at Memorial Hall, and a wise choice it was. I had an inkling that an Arcari live album would be the way to go. 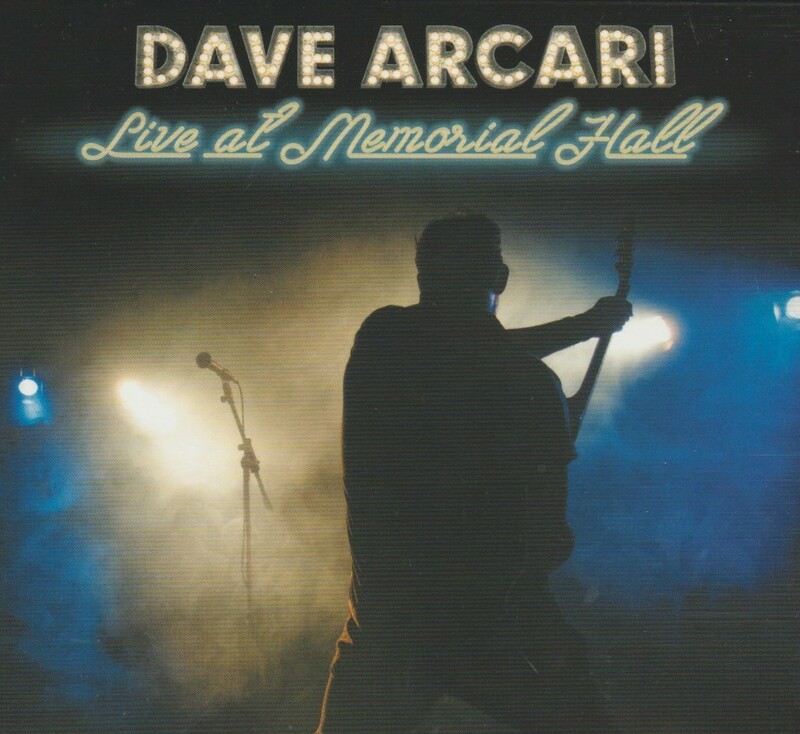 Dave Arcari is an “alt/blues troubadour” and that description works as well as any. Hammering away on his steel guitar with a bottleneck slide on one finger and a wee dram of Scotch, Arcari has his own brand of storytelling. The sandpaper vocals sound like they’ve walked a million miles. Up there alone on the stage, Dave commands attention. You tend to associate a steel guitar with the American south and the bluegrass that came with it. You rarely think of a Scottish storyteller. Yet here he is, so enjoy. I didn’t really know many of Dave’s originals, and only a couple of the traditionals, but this is a very enjoyable album even so. Live albums shouldn’t be mucked with, and this sounds 100% live. Some tracks are mellow and contemplative, others are fast and rambunctious. It doesn’t matter to the crowd who hoot n’ holler after every song. Favourite songs? Sure, how about “Dreamt I Was 100”, “Bring My Baby Back”, “Devil’s Left Hand” and “Whiskey in My Blood”? The fast ones are my favourites! There are 24 songs so I’ll wager nobody’s going home disappointed. Dave Arcari just returned home from a fall US tour. If he ever comes to Canada, I wouldn’t want to miss it. This CD will have to do for now. Oh! And the CD came with an autograph, and I’m pretty sure he mailed it from the US tour, since it’s postmarked from Michigan! That’s dedication! Dedicated to my dear friend Uncle Meat. This CD was purchased off Joe “Big Nose” at the Waterloo branch of the Record Store at which I used to work. 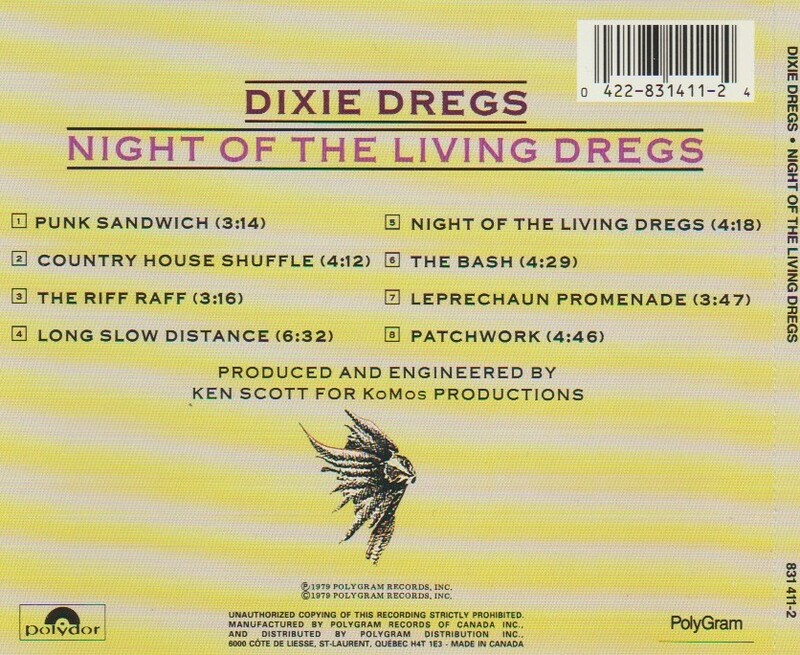 If they could bottle genius, distill it down to its essence, sell it and serve it at a party…then the Dixie Dregs are the music that should be played at that party. The Dregs are undefinable. Just when you think you have them nailed down to a progressive jazz-rock hybrid, they go classical on you, or full-bluegrass mode. Their instrumental chops are incomparable, while still managing to deliver such basic song pleasures such as “melody”, “hooks” and “grooves”. These melodies are usually delivered at the hands of Steve Morse (guitar) or Allen Sloan (violin). Listeners familiar with with the guitar stylings of Morse will have an idea of the kind of songs and arrangements he writes: challenging, but rewarding. Night of the Living Dregs is half studio, half live. The first side, from the cleverly-titled “Punk Sandwich” to the ballad “Long Slow Distance” are carefully crafted studio recordings, each different from the last. While each track is unique and showcases different sides of the band, it is “Long Slow Distance” that really shines. This soft work captures so much of what Morse does well. There are jazzy licks embedded within melodies, and so many different textures of guitar. The live side is recorded nice and clean without a lot of crowd noise. “Night of the Living Dregs” is an upbeat little number, featuring some absolutely jaw-dropping melodic bass playing from Andy West. This is also where drummer extraordinaire Rod Morgenstein comes up to the plate. His playing is so multifaceted and you can hear it on this track. The most fun can be found on “The Bash”, a full-on bluegrass ho-down, chicken-pickin’ full steam ahead. Any jaws left on the floor are hopefully picked up so they don’t miss “Leprechaun Promenade”. There are celtic flavours thanks to the violin, and the song is comparable to Jethro Tull. Then suddenly it turns into Frankenstein’s monster with some eerie keyboards (Mark Parrish). This is complex stuff, not for the timid! The whole experience ends on “Patchwork”, which works as a description of the album at large. It is a patchwork of style and feels, which create the whole. 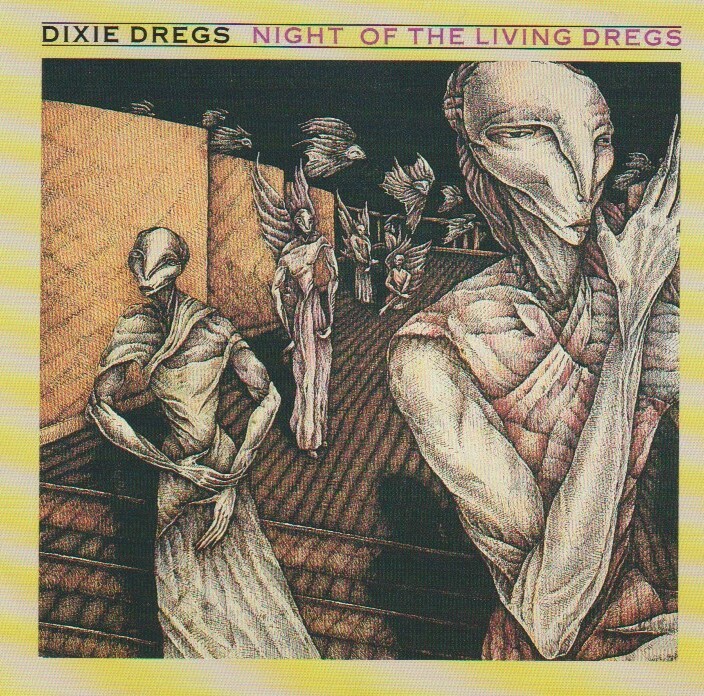 The Dixie Dregs are a challenging listen, but ultimately rewarding. There is plenty of joy in the grooves. The band does not play anything simple or easy. Everything is a little bit of smarty-pants music, but for the listening, this is a delight. Hot damn! It’s the Soggy Bottom Boys! Even if you hated the film (have a doctor check to see if you still have taste left), you can’t deny the fun and authentic roots music on its soundtrack. A bizarre re-telling of Homer’s The Odyssey set in the 1930’s depression-era south, O Brother was nothing if not unique. It mixes a liberal interpretation of Greek mythology, with Americana and the mythology of the blues era. Some people don’t get it, some people do but don’t like it, and others have long been swept away by its charms. Those with an allergy to George Clooney, fear not: he does not actually sing on this soundtrack, although his co-star Tim Blake Nelson certainly does (on “I’m in the Jailhouse Now”). Dan Tyminski from Alison Krauss & Union Station sings for Clooney’s character Ulysses Everett McGill on the signature hit, “Man of Constant Sorrow” though many people assume it’s George. The soundtrack CD is a mixture of light and dark. The first two songs are the perfect example: “Po Lazarus” is a chain-gang work song, just before Ulysses Everett McGill and his two companions break free and embark on their Odyssey. It’s followed by a 1928 recording by Harry McClintock, “The Big Rock Candy Mountain”, a joyful nonsense song about a hobo finding paradise on the rails. The composite of light and dark reflects the movie itself, but makes for a fairly inconsistent listen. The soundtrack follows the progress of the film, but without the story backing it up, it’s harder to go with the flow from song to song. The a capella “O Death” (Ralph Stanley) for example is squeezed between the popular songs “Man of Constant Sorrow” and “I’m in the Jailhouse Now”, so most people will typically skip it. 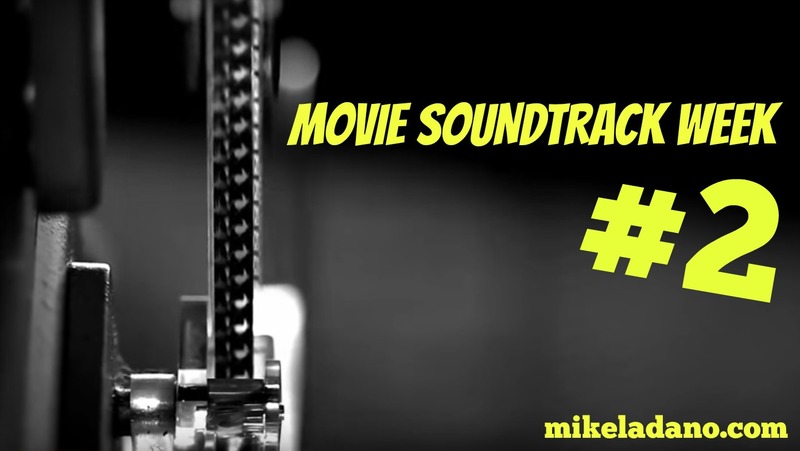 I look at this soundtrack CD as a great “starter kit” for exploring more genres of music. The dominant ones are folk and bluegrass, but there are also blues tracks and hymns. Norman Blake’s “You Are My Sunshine” sounds wonderful sitting in the shade on a summer day. Immediately after that, you get the velvet tones of Alison Krauss, from the baptism scene with “Down to the River to Pray”. You have never heard a more perfect version, serene, still and deep as the water. And, yes, the Soggy Bottom Boys! In the film, Ulysses Everett McGill and his companions Pete, Delmar and Tommy Johnson (loosely based on Robert) wind up cutting a record. There are four versions of “I Am a Man of Constant Sorrow” on the album. The first is the acoustic track shown being recorded in the film. The version that became a hit single in the real world is from the climax, a fully augmented mix with fiddles and slides. That is included closer to the end of the disc. There is an instrumental version on acoustic guitar by Norman Blake, a fine take indeed. The fourth is an instrumental version on fiddle by John Hartford, barely recognisable. All four are quite different but valuable. Blues singer and guitarist Chris Thomas King was cast in the film as Tommy Johnson, and his solo track “Hard Time Killing Floor Blues” is a fine example of acoustic blues. There is plenty of sunny and gleeful folk, such as “Keep on the Sunny Side”, “I’ll Fly Away”, “In the Highways” and of course “In the Jailhouse Now”. Tim Blake Nelson is certainly a multi-talented guy, but the yodelling part is not performed by John Turturro as it appears in the film. Still Pat Enright’s yodel part is one of the highlights of the entire album. It’s important to note that producer T Bone Burnett captured authetic sounding performances here. Close your eyes, mix some scratchy vinyl sounds over it, and you can imagine these are vintage recordings from the 1930’s. Emmylou Harris, Gillian Welch, the Fairfield Four, the Cox Family and more…this CD is a great way to both enjoy an hour of music from the film, and kickstart a collection of folk, bluegrass and more. Dig in! Final bonus: Sh*t LeBrain’s Grandma Says! Steve Morse certainly needs no introduction here. 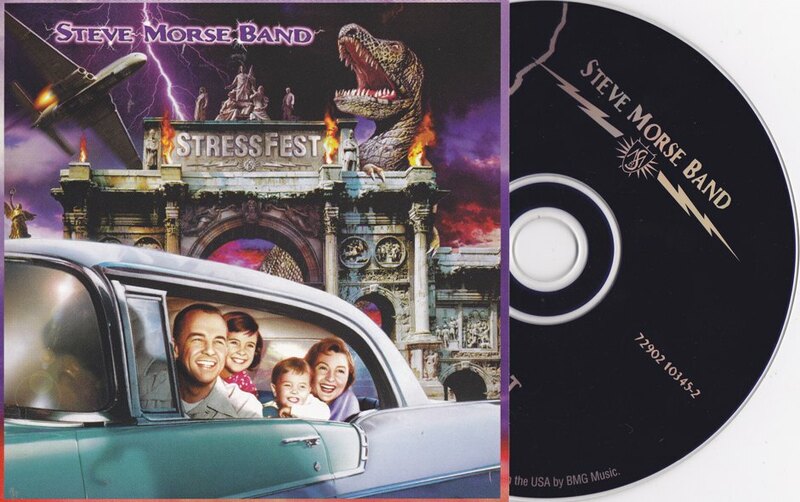 What’s incredible is that the dude joined Deep Purple in 1994, released a Steve Morse Band album in ’95 (Structural Damage), and then both Deep Purple and SMB albums in 1996. Even more incredible when you consider that Morse wrote all the material for the SMB albums himself, and co-wrote every track on Purple’s Purpendicular. The man seems to have no shortage of ideas. 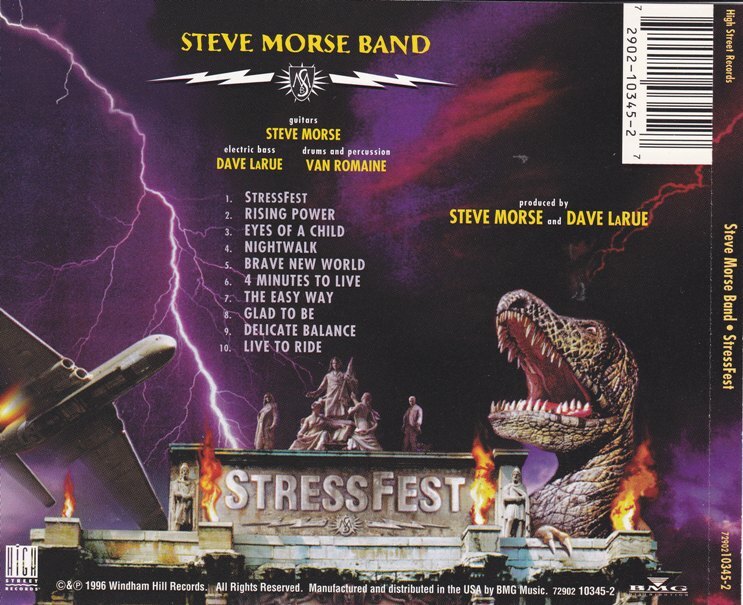 StressFest is another reliable Steve Morse Band album. Joined by Dave LaRue and Van Romaine once more, the band created another textured, varied album that skirts multiple genres with jaw-dropping chops. There are traditional sounding electric blues jams like “Live to Ride”, more delicate moments, blazing guitars, funk, jazz, bluegrass, rock…a little bit of everything. One cool tune is “4 Minutes To Live”, a soft composition with a “piano part” that is actually Steve playing through a guitar synthesizer. But don’t let that scare you. There are plenty of 64th-note thrills and chills, fast picking and deep bends. Backed with the inventive drums of Romaine and the bouncy bass of LaRue, Morse’s songs are a challenging but rewarding listen. What’s especially cool (and reason enough to check out an album like this) is, even though both Deep Purple and the Steve Morse Band are loosely classified as having some sort of relationship with progressive rock and serious musicianship, the music they create is nothing alike. Morse’s guitar is the foundation of both, but there’s little overlap. StressFest‘s songs wouldn’t work as a Deep Purple album, even though there are elements of them that could. Likewise, Deep Purple’s material in general is quite different from the Steve Morse Band. I remember my parents brought this CD back home to me from Michigan, because you couldn’t get it in Canada, even though it was distributed by a major label. Sadly, it is still only available on import in Canada. Bad, Canada! Bad, bad Canada. I love the cover art; that does look like a stressful day indeed!